David Corn thinks Barack Obama needs to get angrier. That’s probably not going to happen. But will he settle for Timothy Geithner? Treasury Secretary Timothy Geithner blasted top U.S. financial regulators in an expletive-laced critique last Friday as frustration grows over the Obama administration’s faltering plan to overhaul U.S. financial regulation, according to people familiar with the meeting. 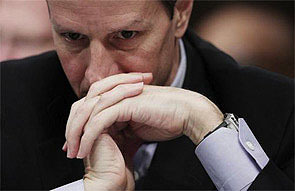 ….Friday’s roughly hourlong meeting was described as unusual, not only because of Mr. Geithner’s repeated use of obscenities, but because of the aggressive posture he took with officials from federal agencies generally considered independent of the White House. Mr. Geithner reminded attendees that the administration and Congress set policy, not the regulatory agencies. Apparently Geithner is pissed off at all the Fed, SEC, and FDIC folks who keep badmouthing his regulatory reforms to Congress. “Administration officials say they aren’t worried about the overhaul’s prospects,” the Journal reports, and I imagine they do say that. But I’ll bet they don’t believe it.